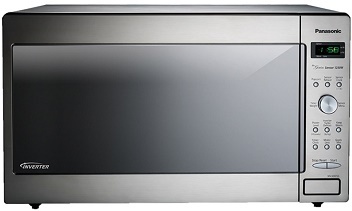 As soon as we tested the Panasonic NN-SD972S’s cooking power, we were impressed by how quietly this model ran. The spin dial is something different but is easy to get used to, especially with the large, clear display that makes operation simple. However, some users may prefer the traditional touch pad and will want to keep the manual handy in order to learn all the buttons’ functions. The features for this model are well thought out, particularly the one-touch cooking option and the keep warm feature, which kept a dish warm enough to eat without overcooking it or drying it out. Ultimately, despite a slight learning curve, this Panasonic model is designed to provide convenience and excellent cooking power. Just be aware that, as a large model, it takes up a lot of room on the counter. This model is available for $169-$200.